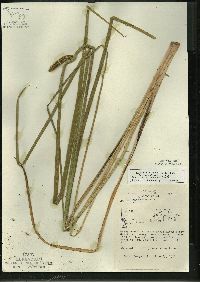 Leaves basally white with pink or red, otherwise bright green; major veins 2--6, ± equally raised above leaf surface; cross section swollen in center, gradually tapering to ends. 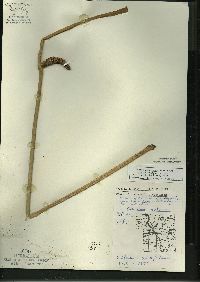 Vegetative leaves to 1.45 m; sheathing base (proximal part of leaf) 18.1--51.8(--58.8) cm; distal part of leaf 31.2--88.6(--100.4) ´ 0.3--1.2 cm, usually slightly longer to more than 2 times length of distal leaf, margins usually entire. 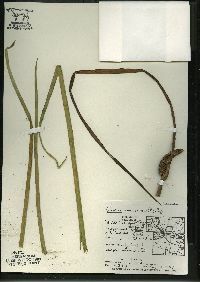 Sympodial leaf (46--)56.8--148(--166.7) cm, usually equal to or slightly longer than vegetative leaves; sheathing base (20.9--)25.3--74.1(--100.2) cm; distal part of leaf (20.9--)27.9--77.9(--92.6) ´ 0.3--1.3 cm. Spadix 3.3--7.4(--8.7) cm ´ 4.7--10(--13.3) mm at anthesis; fruiting spadix 3.5--7.8(--8.8) cm ´ 6.9--18.2 mm. Flowers 2--3 mm; pollen grains usually deeply staining in aniline blue. Fruits obpyramidal, 4--6 mm. 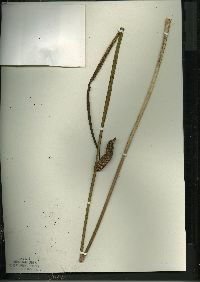 Seeds (1--)6(--14), tan, narrowly oblong to obovate, (2--)3--4 mm. 2n = 24. Flowering late spring--mid summer. 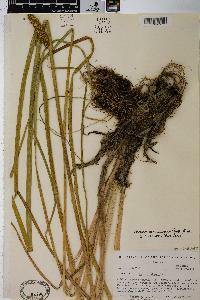 Wet open areas, marshes, swales, and along edges of quiet water; 0--900 m; Alta., B.C., Man., N.B., Nfld. and Labr. (Nfld. ), N.W.T., N.S., Ont., P.E.I., Que., Sask. ; Alaska, Conn., D.C., Idaho, Ill., Ind., Iowa, Maine, Mass., Mich., Minn., Mont., Nebr., N.H., N.J., N.Y., N.Dak., Ohio, Pa., R.I., S.Dak., Vt., Va., Wash., Wis. Acorus americanus, a fertile diploid, occurs from northeastern United States across Canada and the northern plains. 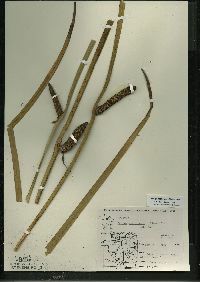 Specimens from central Siberia with similar leaf venation were examined, and the species is perhaps holarctic in distribution. 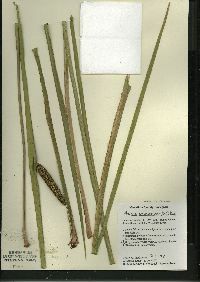 Examination of additional material is necessary to determine if northern Asian diploid plants are conspecific with A. americanus. 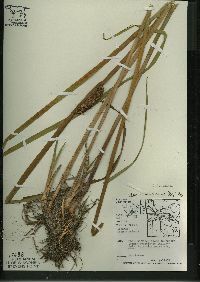 In North America, Native Americans probably played a significant role in the present-day distribution of A. americanus because sweet-flag rhizomes and plants were valued by many groups and were objects of trade. Disjunct populations occur in localities that are often near old Native American village sites or camping areas (M. R. Gilmore 1931). 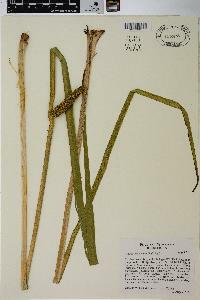 Acorus americanus is susceptible to infection by Uromyces sparganii (Uredinales). 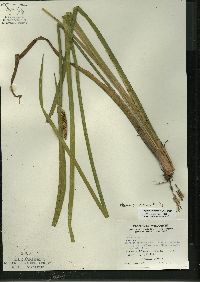 Perennial herb to 1.5 m tall Leaves: crowded at the base, fanning out like iris leaves, white to pink or red at base, becoming bright green, to 1.5 m long and 2.5 cm wide (sheath base 18 - 52 cm long), lance-shaped, usually having two to six prominent veins. Leaf cross section is swollen in the center, tapering toward the edges. Flowers: borne on a cylindrical spike with a very fleshy axis (spadix) arising at the junction of the scape tip and spathe. The spadix is 3.3 - 7.5 cm long and 4.7 - 10 mm wide. Individual flowers numerous, with six tiny (2 - 3 mm) and yellowish brown tepals. Fruit: hard and dry outside, jelly-like inside, 4 - 6 mm long, shaped like an upside down pyramid, containing one to three tan seeds that are narrow oblong to inversely egg-shaped. 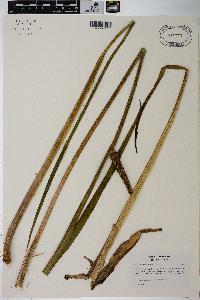 Rhizomes: branched, growing horizontally at or near surface, containing a sweet aromatic oil. 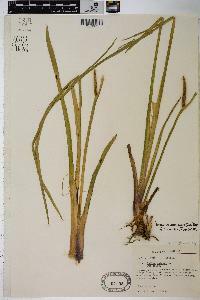 Flowering stem: (scape) arising from base of plant, resembling a leaf, as long as or slightly longer than the leaves, triangular in cross-section. A long, green, flattened, sheath-like structure (spathe) continues vertically at the tip of the scape. 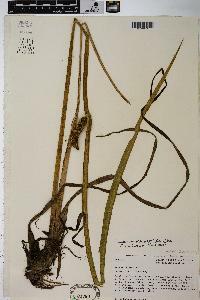 Similar species: Acorus americanus and Acorus calamus are very similar and are sometimes considered the same species. However, there are a few distinctive characteristics that are used to distinguish the two species. 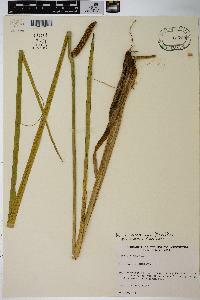 Acorus calamus is a sterile triploid (three copies of each chromosome) that does not produce mature fruit. It has a prominent midvein, but the other veins are inconspicuous. 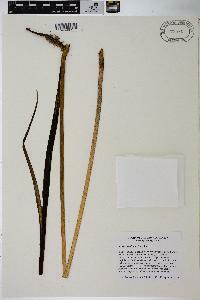 Generally, A. calamus has longer and wider leaves and longer spadices than A. americanus. Habitat and ecology: Marshes and low areas. Notes: Native Americans used this species during ceremonies and for medicinal purposes. It was also a valuable plant used in trade. Populations appear to be concentrated near old Native American villages, suggesting Native Americans played an important role in the current distribution of the species. Etymology: Acorus is the Latin form of the Greek word, akoron, an ancient plant name. Americanus means "from America." 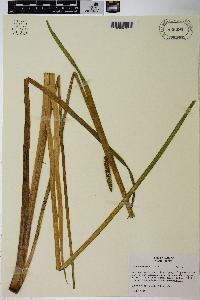 Widely distributed in the state, mostly in noncalcareous springy places along streams and about lakes. Local in the lake area and in the Tipton Till Plain and very local to rare in the unglaciated area. 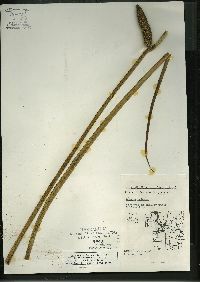 It is usually found in large colonies, sometimes covering acres in old stream beds. This species flowers and fruits throughout the state. 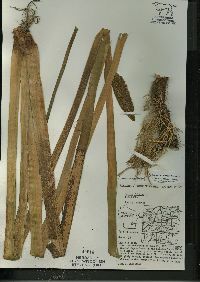 In medicine, the rootstock is known as calamus.